Today’s challenge is to make a piece of art and give it away. Isn’t that where we all started? We made art as children and ran home to mom to give her our wondrous works. She proudly displayed them on the refrigerator, or wore the macaroni necklaces. Grandparents we another satisfying choice to share our art with. When my grandma passed away many years ago, I found she had kept many of those art gifts and I now have them back. How special it made me feel that she had kept them all those years. So giving away our art is really no challenge. It makes us feel good inside. 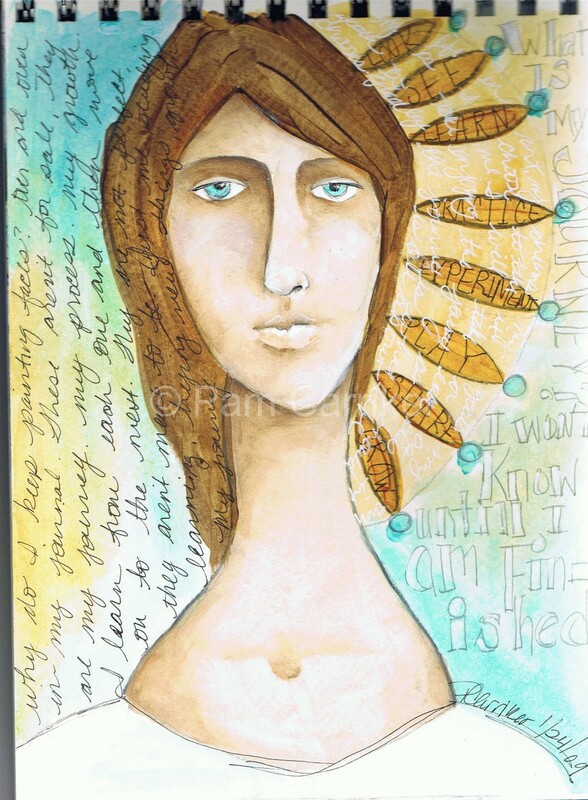 My journal page is a Modigliani inspired piece with my own twist and a little touch of Misty in the petals. I have also done a little sister piece that will be going to a wonderous queen of mixed media, who is in the hospital. I hope it will brighten her day. How sweet of you for giving someone a gift! I haven’t been able to keep up with this week’s themes but I love looking at what you and others have done.I still have some of my children’s art work 20-30 years later!